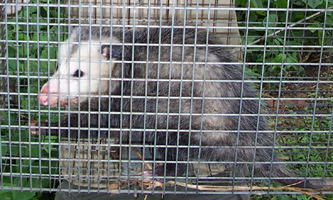 We provide general critter trapping and removal of unwanted nuisance wildlife from your property. We take care to be humane, while following Virginia laws. Most of the calls we get are because homeowners hear animals scurrying around inside the attic or walls. Most of the damage inside a houes or attic is unseen. Rodents like squirrels, mice, and rats often chew on electrical wires. Wildlife such as raccoons, bats, birds, opossums, and rats spread several diseases that humans can and do catch, such as Histoplasmosis, Salmonella, Leptospirosis and more. Many critters leave droppings and urine in an attic or cause mold or odor problems. We also handle animals outside the house. It could be a critter that has dug a large hole next to your house, or a raccoon in your garbage cans, an opossum that is stealing pet food, or a skunk living under your deck, causing an odor problem. Some animals destroy your garden or landscaping. Or perhaps you are simply scared of snakes. Whatever the problem is, our wildlife experts can remove the source of the problem, and prevent it from happening again. We are not a Richmond extermination company, nor pest control. We are dedicated Richmond wildlife control experts. 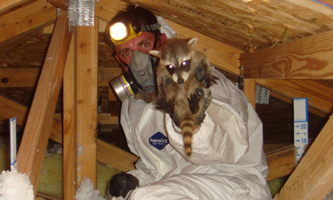 Richmond Raccoon Removal - Raccoons commonly live in the attic, where they cause damage. They can also cause many problems outside. Richmond Rat Extermination - We solve rat and mouse problems PERMANENTLY, by finding and sealing shut any and all rat entry holes. Richmond Bat Control - We have a 100% success rate safely removing Virginia bats from buildings, and we guarantee our work. Richmond Squirrel and Rodent Removal - For any critter, such as squirrels in the attic, we remove them, repair damage, & clean. We believe we are Richmond's best. We do a complete job, from start to finish. We remove wildlife humanely and effectively. When we encounter animals inside a house, we inspect every part of the house, from ground to roof, to identify all the areas of entry, and we perform professional repairs, with guarantee. 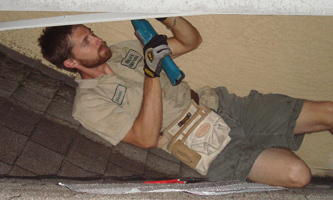 We inspect inside the attic to find any damage, and provide full cleaning services. We offer attic restoration, permanent rodent control, bat colony exclusion, bird prevention, snake removal, dead animal removal and odor control, and more. We are fully Virginia licensed and insured, and ready to solve your Richmond critter problem. Call us any time for a phone consulation and price quote, at 804-621-7450. The house mouse is one of the most irritating Richmond bird control pests because it will feed on food that is meant for humans and pets and it is also likely to contaminate the food and is likely to cause food poisoning. It is therefore important to ensure that you Richmond bird control come up with the appropriate ways that will help prevent and also control their manifestations. They also destroy house structures and other property with their gnawing. You have to inspect your home and identify any possible entry points. Inspection therefore begins from outside the house, you have to check your fences and Richmond rodent extermination ensure that there are no openings, in case you come across any, and then you have to ensure that they are covered up. When this is done, you go into the house where you will ensure that all the possible holes are Richmond rodent extermination filled. Closing the entry points is therefore an important step that will prevent the mice from entering your home. House mice can survive any where even if there is limited food supply; poor sanitation will always attract the mice and this will increase the chances of them thriving in great numbers. Good sanitation is therefore the best option because you will be able to prevent a Richmond bat removal large number of them evading your premises. You have to pay attention to places that mice are likely to opt for. You have to get rid of food that is not used and if there are any remains ensure that they are stored in tight containers that aren’t easily accessible. You also have to ensure that the kitchen floors, sinks, shelves Richmond bat removal and counter tops are extremely clean. When your pets are done feeding, you have to make sure that you clean up their mess immediately. You also have to inspect the dark corners of the rooms and ensure that they are clean. If you have a food store, you have to make sure that the food is packed in materials that cannot be easily destroyed. You have to dispose of old newspapers, cartons and other old clothes because they are the greatest attraction items to house mice. It is a sure method that can prevent mice from evading your home and if they are present in the home and you intend to control their numbers then this is the best technique that you can use. These traps do not rely on harmful poisons in order to work, you are always sure Richmond snake removal that the mouse will be trapped because it is will be your chore to ensure that they are released into the wild or to the necessary animal control units. In case the rats are killed on the trap, you will be able to personally Richmond snake removal dispose them unlike the poisons. You will always be able to avoid dead mouse odors in the house. The other fact about traps is that they are very cheap while others can be made homemade. There are several traps that you can use, snap traps are very effective especially when the house mice come into contact with them, bait traps on the hand require only require small amounts of food Richmond rat control that will lure the mouse towards the traps. The multiple mouse traps are easy to use and they can catch several house mice at the same time. Set traps can be hidden where the mouse consider as their perfect hiding places. In order for the traps to be effective you have to ensure that they are placed within a close range. In case they evade one trap, then they are likely to be captured by the next trap. This should be your last resort because it is very hazardous to both parties. They will kill the house mice whenever they come in contact with them. They are also Richmond rat control risky for other pets because they are likely to consume the poison. When you purchase the poison, you have to ensure that they are placed in areas where other pets cannot access. It's beautiful experiencing all four seasons here in Richmond. However, it's not so beautiful when the seasonal changes cause wildlife to seek shelter in your home. 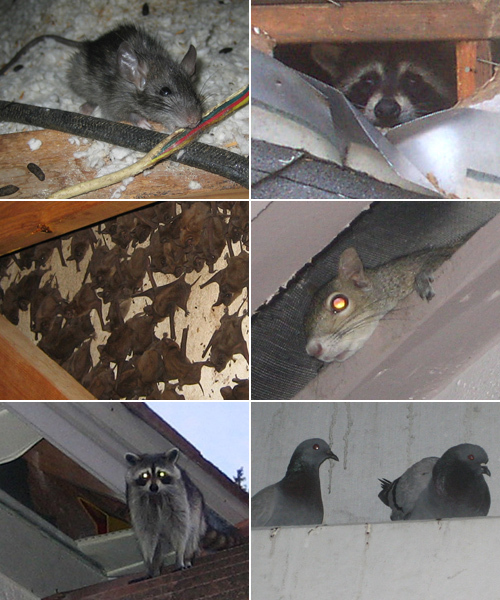 If you are hearing noises, such as scratching, in your attic you could have a raccoon or squirrel issue. We answer our phones 24/7 to service you when you need us! We proudly service the following cities: Atlee Beach, Bon Air, Centralia, Chesterfield, Disputanta, Enon, Ettrick, Fair Oaks, Glen Allen, Glendale, Highland Springs, Kingsland, Lakeside, Laurel, Matoaka, Midlothian, Montrose, Moseley, New Bohemia, Prince George, Sandston, Short Pump, Soloman, Varina, Winterpock, Mechanicsville, Petersburg, Hopewell, Colonial Heights, and Chester. We also service the following counties: Amelia County, Caroline County, Charles City County, Chesterfield County, Dinwiddie County, Goochland County, Hanover County, Henrico County, King William County, New Kent County, Powhatan County, Prince George County, and Sussex County. We are ready to solve your Richmond wildlife removal issue! Call us any time at 804-621-7450 - We look forward to solving your wildlife problem!